It’s never a good idea to have your web site throw error messages, because it makes the visitor suspicious about how viable your company, products or services may be. I clicked the OK button and continued to look at the search results for WordPress and found a handful, so obviously this platform is not a big one for the 100,000,000 users of WordPress. Most of us just visit Google and find plenty of free WordPress tutorials out there instead of paying for training. I did continue on the OpenSesame site to use their Chat feature and they responding quickly, asking me to email a screenshot of the error message to their support department. 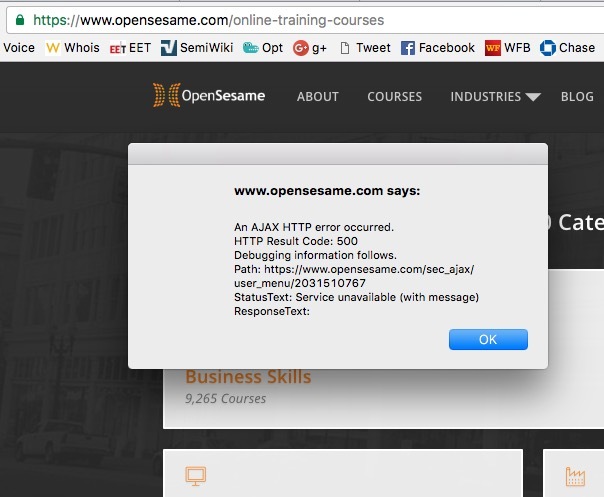 I wish OpenSesame much success, however they really should be doing more QA work on their web site by having testers click every button and link to double-check that all is working OK, instead of letting a hapless, first-time visitor stumble onto errors. Thanks for the link to my About page, there was a plugin used for the short-code that was disabled. So I’ve enabled the plugin and the page has content.